Kamisama Hajimemashita was a really pretty and easy to watch anime. If you liked the first season, Kamisama Hajimemashita◎ did not disappoint at all; in fact, the romance portion got a little heavier, so all you romance lovers out there are sure to be saying "d'aww" at least three times an episode. I highly recommend it if you enjoyed S1. The story picks up right from where S1 ended, but it takes a bit of a break from Nanami "learning how to be a Land God" to more of a "Nanami being a boss God" approach. There are a ton of new characters, and reappearances of older ones (i.e. Himemeko x Kotaro, the one and only Kurama, and Mizuki), making for a fairly diverse story line and change in direction. But it was a good change, so nothing was too stale. Nanami delves deeper into her duties as a Land God, such as visits and becoming a stronger deity. When she's figuring this out, she still carries support from her faithful familiars, Tomoe and the adorable snake Mizuki. They fight, Nanami breaks it up, and they go on with their lives. While this is happening, a variety of plots unfold, all leading to Tomoe having successive epiphanies about his cheerful human goddess. The new characters were all pretty funny and added a nice touch to the whole atmosphere of the show, even though some of their stories were left hanging, like Kirihito, Tomoe's old companion from his wild fox days. But we also got a deeper look into Kurama's character, which was a sweet bonus. As for the main characters, Tomoe this season is ridiculously cute. Seriously, I could not get enough of him, with his revelations and inner monologue. There's actually a lot more focus on Tomoe this season as well, so you get more time to understand his thoughts, which was a good addition. And Nanami was still the same oblivious and happy-go-lucky Nanami as last season, but perhaps a bit more mature and refined as a deity. Yes, she continues her funny antics, like creating Mamoru, the adorable monkey child, who is added to the list of "Things/People that Antagonize Tomoe". But hey, that only serves to bring joy to us viewers, right? XP To sum it all up, character development was as strong this season as much as the last, if not more so. Okay, here's where it got a little different. With season one having 7 producers and season two having 3, the art style definitely took a turn. It wasn't bad at all; but it was really easy to tell the contrast. The colors are still charming and pleasant, but the style is a little simpler and there are a ton of close-ups each episode. As in, like 30 per episode. It wasn't exactly annoying, but it was a tad abundant for me. For the rest, I had no complaints. Still the same characters and designs we know and love. The artist Hanae has provided both seasons of Kamisama Hajimemashita with adorable and awesome OPs and EDs, and I love it. The songs are cute and dancey, but they still tie in with the whole atmosphere of the show. Can't really complain, they just work. Also, I felt like the background music they used was very effective in each scene they used to get across the tone of the situation. It was nothing too fancy, but it was still satisfying. I realize I have been comparing S1 and S2 a whole lot this entire time, but don't get me wrong, Kamisama Hajimemashita is a solid show. Heck, S1 is in my favorites. S2 was just as good, and probably even better if you're just here for a ton of googly-eyeing. Which, I was, not gonna lie. Absolutely watch this if you are having any doubts. This is by no means one of those shows with a terrible S2. Really, this season was nearly on par with the first, which makes it rather awesome and a good watch. If for no other reason, watch for Tomoe. Hey, I won't judge. Much. Shojo manga series by Julietta Suzuki that adapted once again into anime after it first season, Kamisama Hajimemashita. The first season left some curiosities to the audience who enjoys romance genre about “what will happen between the main characters after this?” Well, the answer might be found in this second season. But, I can’t guarantee that you’ll find all of those answers in it either. So, it would be better just watch it for yourself and you will know what I meant. The story remains around our main characters, let’s just say “the girl and the fox” who continue their life in Mikage’s temple after several of supernatural events in the first season happened and affect their relationship with each other very well into some kind of “more-love-interest” relationship. The first season starts with the character’s past and main conflict that goes on until pops up some supporting characters who help fill the sensation, mood and the story itself to be life and joy. But, we’re not gonna talk about the first season in here. So, still. according to that, just don’t confuse when you see the beginning episode of the second season starts with scary vision and dark red color background which apparently a dream belongs to a white-pale but cool guy that just wake up from his sleep. You’ll need to memorize the last episode of the first season to know who is that character. But, don’t worry if you lazy to watch it again because you’ll see a “familiar introduction” after that (just like in the first season) and you’ll know who that is when you watching this anime completely. Well, back to the main topic, the story consist of two parts in one episode. Those parts linked to one another and they give sign about it with some “free pic” (I called it because I always save the pic whenever they show up haha, so it is “free”) which is similar to most other anime. In this season, there’s different seasoning than the first, for an example like the problem solving of the conflict that I thought it would spend a long time to be solved but it solved with some simple idea. I didn’t say that was bad, but what can I say? It’s so supernatural, everything could happen. Or I guess they need to hurry the solving part to match or catch up the amount of episode of this anime which I suggest they need to plus the amount of it to do it just like I thought. But, despite it, I think the story was good enough, I like the writer’s idea whenever there’s romance scene that somehow manage to balanced the comedy which makes me feel the essence and the character’s feeling about themselves or the events that they’ve been through. The ending was absurd, that makes sense because the pace and new character that shows up. They need more episode to make it epic “if” this is their last anime adaptation. (I hope not!) But, it’s not that bad to watch it till the end. It’s romantic, it’s hilarious, it’s supernature and fantastical, it describes how love could grow between a human and a yokai. I would say that is “very touching and makes my heart melted”. The art was good. It’s certainly nailed it to bring the romance and peaceful aura to the audience. It fits the story although I hope they could detail the background to help the story a little. But, I don’t mind about that. Because I believe there’s limit in everyone’s skill and we should respect other’s work. It’s unique in a good way and actually, I found that I fond of the character’s art. All with the background effects, filler and especially the chibi or funny looking expression that often shows up. Suzuko Mimori’s voice suits Nanami well. I loved it, especially whenever she shouts and mad on Tomoe because some kind of simple or serious problems she had with him. And the character voice of Tomoe is even better. I could say that Shinnosuke Tachibana has succeeded to cast Tomoe from the first season and I bet he especially nailed it for drawing attention to female’s audience out there to watch this anime too. And don’t forget about the other’s character voice actor like Daisuke Kishio (Kurama), Nobuhiko Okamoto (Mizuki), Junichi Suwabe (Akura-oh), Horie Yui (Himemiko), Akira Ishida (Mikage) and many others, they have succeeded too. I will not protest about them. They’re professional and they absolutely “nailed” it! For the OP and ED theme, I’d like to say that it’s fair enough. The singer as same as the first season. It’s good and cute to hear. Talking about the back sounds, I…. really loved them. They hit the feel, the situation and help the story serving a lot to the audience. My favorite back sound was the sound that historical but peaceful when there’s some meaningful scene that shows up. There’s new characters that show up in this second season. For an example like Akura-oh (Tomoe’s partner from the past) who enjoys caused destruction through all over the world or Jirou (the fourth chief of Kurama Mountain) that suddenly turns into a memorable yet important for several episodes (you’ll understand when you watch it) and many others. They have unique characteristic and amazing looks too that make my brain memorize them. Besides that, I like how Nanami develops her character even more in this season (through her past or her attitude towards some problems that makes her skill of spiritual power level up) and I like how she could handle her feeling towards Tomoe. I see her courage even more rather than the first season and by that, I can tell that her character was well-developed. For Tomoe, he changed to care for Nanami a lot rather than usual, he more often to jealous, sulking, teasing and see Nanami differently especially after the last episode when he saw Nanami’s past. And he did realize what he actually feel towards Nanami in this season. I would say that their both character develop as same as their feeling to one another. I love the quotes too especially the quote that Mikage said to Nanami about “the taboo love between human and yokai”. I enjoy watching this. I can’t believe it for myself either but it is enjoyable. For several times, the director and the writer had succeeded to draw curiosities and cut episode when there’s surprising event. I hate whenever they did that, but as long as it worth to watch, why not? As it ended, I just hoped that the last episode was not the last of it. In conclusion, “all of you who likes romance or rom-com story genre would be best to watch this anime right now”. 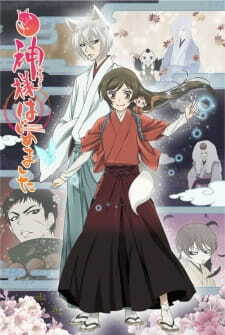 Kamisama Hajimemashita (Season 2) it’s worth to watch, funny, heartwarming and I found it amazingly enjoyable (haha). Well, I suggest you watch the first season before watching this one. The second season of kamisama hajimemashita contain Tomoe's past and the feelings that Tomoe has for his lady and mistress, Nanami. Like many other stories it's about a female girl who's poor life soon turns into a rowdy one filled with friends (as most of you already know this is mentioned in season 1) Season two is about the female lead, Nanami, meeting new gods and finally taking charge and developing into the proper Land Goddess. It has romance, comedy, and drama. The second season has many new settings, characters, music and moments where you'd laugh. The art is the same as the first season, at least to me. Since this is a light hearted anime the colors are all pretty and go with the anime. It's pretty too look at with the light colors here and there. The details are also great, but they seemed to be less exact than the first season. This though didn't ruin the experience. I think the OP and ending are better than the first season. Reason why is because it's more up beat and goes with the anime. You have no idea how many times I ended up singing the OP at random times. "Kamisama no kamisama" by Hanae starts out with a flute which will already get you in the mood. (Laughs while remembering Mizuki trying to play the flute) The endings you want to watch the next episode because of the cliffhangers and cause of the song. Not only was there Nanami, Mizuki, Tomoe, and the shrines servants, but manyyy more amazing characters got introduced. The antagonist was introduced, Kurama's past was discovered which led to even more awesome characters. It was a character boatload!! Every character was awesome in their own way and you'd always want to see more of them. Even the antagonist. The quarrels between Tomoe and Mizuki over Nanami and over stupid little things always made me laugh. You can never get enough of these two. In my opinion, I think the character development and new characters was my favorite part of the entire second season. I could never get enough of this. Ever since I finished watching the first season I've wanted more and I finally got it. I was so overjoyed when I started to watch the second season. Since it was ongoing when I watched I hated the fact that I had to wait a week to see the next episodes. Them cliffhangers are suspenseful! Even though it ended I still want more. *fingers crossed* hopefully there will be a season 3. Season 2 was better than season 1 in my opinion. Season 2 Op is more upbeat, has a handful of new characters(adorable ones too! ), and I liked seeing the past of some of the main characters. I felt like I knew them even more than in season 1. To be honest, this show always had always been a sort of epitome for what shoujo is. The characteristics, backgrounds, and general premise all points to the direction of what the franchise has tried to be. And from the first season, it capitalized on every opportunity to craft shoujo. Season 2 isn’t far different by experiences as it will feel just like the first season. What that means is another charming trip with our supernatural familiar friends and the all adorable Nanami once again. Out of any show that got the news of receiving a season 2 in 2014, this one hit the mark. It took me by surprise when the sequel was announced especially since it just popped out of nowhere. Make no mistake though. This sequel is something I welcome with open arms. Titled “Kamisama Hajimemashita◎”, the season 2 assumes that you have completed the first season. As it begins directly from where it left off, viewers should be familiar of what they may expect. The show hardly changes from where it had been from the beginning. There’s the familiars, humans, and society that are enveloped by a host of shoujo generics. But for what’s worth, the first few episodes crafts a more independent nature in Nanami. She’s here to prove herself and in fact takes action by attending a Divine Assembly, a meeting between Gods. Being a human herself, one can imagine how she will stand out as the “It Girl”. However, taking a close glance will show that Nanami has established herself as a strong spirited woman. She relies on almost no one and tries to become a better God while fulfilling her sacred duty. As such, this season focuses a lot more on story content rather than romance. The first half of the show easily sends this message as the series focuses on characterization. Not just for Nanami in this case but her partner Tomoe also gets a decent amount of spotlight. There are also some cryptic imagery regarding his past that viewers may be curious of. Because the story context become a rather tense focus, we also have conflicts brewing as well. Mysterious characters such as Kirihito will get viewers wondering about his motivations, goals, and role in this season. Furthermore, there’s a bit of interpersonal problems with our main characters as well. For Nanami, we get the idea that she is trying to become a better God but she still has some doubts here and there. Then, there’s Tomoe who finally seems to realize the depth of his feelings. But what do we get in return? Some cliché romance delivery where neither seems to tie the knot. What that means is that there’s a whole load of teasing but nothing in the end is resolved for their romance. I can’t say this is exactly surprising with shoujo content. It usually takes time for this to develop and the first season portrayed that quite clearly with its romance angles. But as for this show, romance itself should be a more prominent term. It’s like a heart of this show that needs to pump (almost literally in a way) to get the show moving. Sometimes, this season does that cleverly and other time moves back to square one For what’s worth, season 2 relies much more on its story context rather than romance focus. Despite this, the second season still has that soft feeling of charming elegance. Some episodes has that slice of life feel combined with shoujo themes. And while most of this is hardly original, it creates the essence of a satisfying shoujo. Adaptation wise, the show retains its comedy and drama. Most of the comedy is lighthearted with the expressive tones and scenarios that can be taken to heart. To say the least, this show always balances itself when it comes to all of its plot elements. From the cryptic imagery, dialogue, and plot developments to character building, this sequel is more or less of shoujo story book. Each page adds more context to some parts of the story while focusing on certain characters. In fact, Tomoe and Nanami aren’t just the only main characters we get to know more. There’s other prominent figures such as Kurama and Jiro that we get a nice bite out of their past lives. In retrospect, the franchise’s characters all stand out in some way along with this delicate story wrapped by shoujo. Technical production in regards to the artwork remains generally the same for the sequel. Nothing has changed in regards to the world fiction of this series. It’s marvelous and can even be breathtaking at times to see the difference between the spiritual and human world. In particular, the Netherworld brings a different mood to this charming shoujo. Character designs remains generally the same for all the main characters. While we do get some new cute characters such as a monkey familiar, hardly anything else has changed. Nanami does have a more independent nature in her for this season though as she becomes more determined than ever to become a better God. The expressive emotions she delivers gives credibility to quite just that. Soundtrack is mostly decent by standards. Sadly, it’s not really a strength for this season. OST still has that serene-like feeling although not memorable enough to leave a strong impression. On the other hand, the OP/ED songs has a really sharp focus with its shoujo style. Of course, we can’t forget the main characters who are able to express their thoughts and feelings with their voices. While nothing is largely memorable by experience, it’s still charming to watch the characters act out in their roles. By voice content, it is satisfying. At some point in this season, it won’t be a surprise to realize that the sequel drives its story by pushing its plot elements. While the first season has an intuitive focus on romance, this season takes the steering wheel to go with the context of the story. But there are still room for romance because every shoujo focuses a bit more on that. For what’s worth, Kamisama Hajimemashita◎ stands out as a way to show how much Nanami has changed from the beginning. The relationships she has with others is still a good focus in this season with its interpersonal perspectives. It has a convincing nature with everything it sets up from Nanami’s will to become a better God and to Tomoe’s realization of what he feels towards Nanami. Be prepared for a ride that blurs the line between humans and Gods.